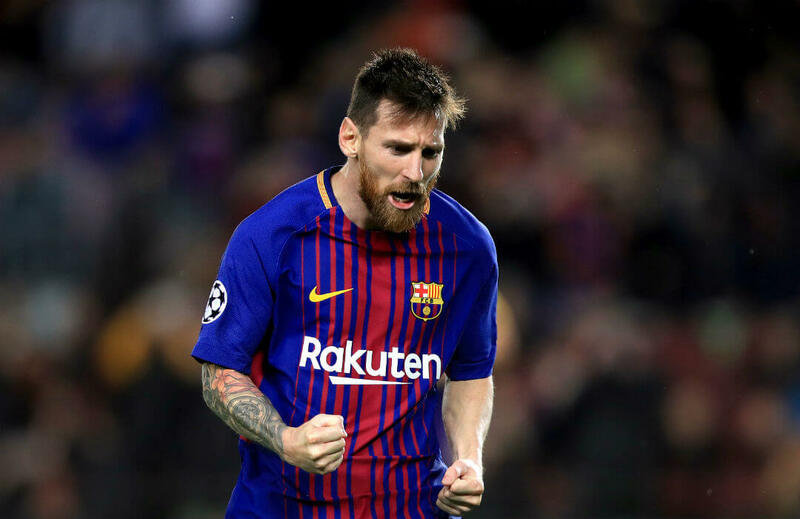 Ten-man Barcelona cruised past Olympiakos 3-1 at Camp Nou in the Champions League on the same night star Lionel Messi reached 100 goals in European competitions. The hosts were ahead 1-0 when Gerard Pique tapped home Gerard Deulofeu’s cross with his thigh and his wrist to incur his second yellow card of the match, but Messi curled home from a set-piece just outside the center of the box to make it 2-0 and a brilliant deep run three minutes later allowed him to set up Lucas Digne for Barca’s third goal. Messi has 97 goals in Champions League matches and three goals in UEFA Super Cup fixtures. Only Real Madrid’s Cristiano Ronaldo, who has 112 goals in continental tournaments, has more goals than Messi in European competition. Dimitrios Nikolaou gifted Barca the opener when the Olympiakos defender intercepted Deulofeu’s cross but diverted it past his own goalkeeper Silvio Proto in the 19th minute. Piquet, who was booked with a yellow early in the game to stop a counter-attack, could have doubled the lead three minutes before the break but he misjudged Deulofeu’s cross, tapping it home with parts of his forearm, wrist and thigh, prompting officials to take him out of the fixture. Deulofeu bore the brunt of Piquet’s ejection as he was replaced with defensive midfielder Javier Mascherano at the half, despite being a threat and a playmaker on the right flank. Messi then took charge just after the hour mark, when he squared up to take a free-kick just outside the middle of the box and unleashed a spectacular curler that bounced off Proto’s hand but still landed on the back of the net. Barca added a third three minutes later, when Messi ran deep near the goal line, before sending a back pass that both Paulinho and Iniesta missed but was luckily recovered by Digne, who powerfully struck the loose ball with his left foot and zoomed it past the scramble in front of goal and into the net. Nikolaou then regained some form of pride when he headed home the consolation goal following a pinpoint corner from Konstantinos Fortounis. Barcelona have a perfect record in Group D of the Champions League and are also unbeaten in eight La Liga games, but Valverde is not yet sitting on his laurels.